SiteScan is a leading provider of subsurface imaging and utility locating. We utilize advanced, non-destructive methods to provide Better Vision through hard surfaces like soil, concrete, asphalt. Our Ground Penetrating Radar (GPR) and Electromagnetic Location services prevent unexpected setbacks in many construction projects, allowing you to work safely and avoid costly damage to existing infrastructure. Knowing where existing utilities may create conflicts gives our clients Better Intelligence to plan and execute their work efficiently and safely. Our service-oriented culture drives our staff to be the most responsive consultants in the industry. We pride ourselves on our ability to provide same day response to urgent or last minute requests. We understand that delays can be very costly during construction. Unforeseen conditions can and do grind projects to a halt. In these situations your emergency is our opportunity to deliver on our commitment to provide the highest level of service available in the industry. And, we know you need the results fast, so we provide entirely digital, real-time reporting so you get your reports before we even leave the job site. 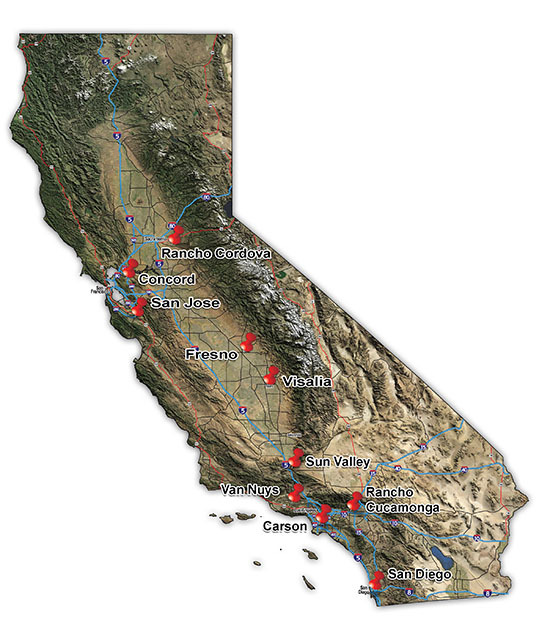 We have professional offices strategically located within California’s population centers in Los Angeles, the San Francisco Bay area, San Diego, the Inland Empire, the Sacramento Valley, and the Central Valley. With a team of more than 300 professionals on staff, we have the ability to quickly respond when needed. We offer same day response in emergency situations. We guarantee a 24-hour response to all inquiries. We offer digital on-site reporting so you don’t have to wait for your results – you get them immediately. As a forerunner in the field of ground-penetrating radar and electromagnetic location, SiteScan uses only the most current and advanced technology to ensure you get the best real-time on-site data possible. We utilize the newest techniques including electromagnetic location of utilities through direct connection, induction or sonde in combination with ground penetrating radar to identify and locate subsurface utilities, rebar, reinforcing steel, electrical conduits, water lines, post-tension cables and communication lines inside of concrete. GPR also has the capability to detect the presence and extent of voids within the subgrade to determine the structural integrity of the concrete. Our processes are digital from initial quote development with virtual site walks via satellite imagery, through final reporting using our proprietary iPad application. We leverage today’s cutting edge technologies to help solve our clients’ problems and execute our work efficiently. We are leaders in the deployment of new technology for Concrete Scanning and Utility Location and we pass on those efficiencies to our clients with faster service and lower costs. SiteScan’s proprietary application provides unique intelligence and instant report delivery capabilities before we ever leave the jobsite. We utilize only the most advanced GPR and Electromagnetic equipment available today. We leverage available aerial photos and satellite imaging to provide quotes in the most efficient and timely way. SiteScan can even do virtual jobsite walk-throughs with you using satellite images to ensure we fully understand the scope of the project before we start. We are a driven to consistently deliver our best results, both through high-quality technical expertise and in devotedly responsive interactions with our clients. The technicians sent to your jobsite go beyond just scanning and reporting, they work to trouble shoot and solve problems to get you the results you need. Better Vision, Better Intelligence, means that our professional staff here at SiteScan will give you results with unparalleled accuracy and insight. No matter the size or scope of your project, we have the field experience, commitment to quality, and technical resources to overcome any challenge and execute our work to suit your needs. We pride ourselves on tackling challenges head-on, coming up with unique solutions and ensuring projects are done right. Our professional staff will assess each project and the specific needs and develop right sized solutions to deliver the information you need in the most efficient and expedient way possible. Our engineers are available for on-site problem solving via satellite imaging and video conferences. We have extensive internal quality control resources to ensure your results are as accurate as possible including a full-time independent Quality Manager. We have served a wide variety of clients with our Concrete Scan and Utility Location services including Kaiser Permanente, Sempra Energy, Los Angeles Unified School District, Metro and Irvine Unified School District. We consider the prevention of accidents an integral part of every operation. We are committed to the prevention of accidents so that each of our employees returns home safely in the same condition as they arrived to work each and every day. There is no job or task performed by our staff that is so important or urgent that it cannot be performed safely. Our staff has extensive experience working on construction projects of all sizes and working in sometimes complex and hazardous work environments. Each member of our staff receives ongoing and recurrent safety training on a regular basis to ensure that we remain at all times cognizant of our surroundings and take the necessary steps to safely execute our work. We offer competitive prices and work with clients of any size. For every project, we assess the scope of the job and then advise companies on what we believe will give them the best, most accurate results. We develop the right-size solution for each project, ensuring that we are delivering the best quality information at a competitive price. We have helped on hundreds of projects for a wide variety of clients with our Concrete Scan and Utility Location expertise and we are here to help you. When you are looking for Better Vision, Better Intelligence, choose SiteScan. Or complete the form to the right and one of our consultants will contact you the same day.